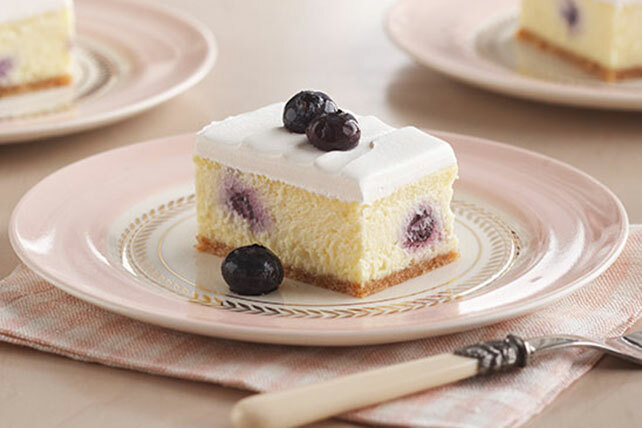 End your meal memorably with this Lemon-Blueberry Cheesecake Dessert. This Lemon-Blueberry Cheesecake Dessert is the perfect mix of sweet and citrusy. Mix wafer crumbs, 3 Tbsp. sugar and butter; press onto bottom of 13x9-inch pan. Bake 10 min. Beat cream cheese, remaining sugar and flour in large bowl with mixer until blended. Add sour cream; mix well. Add eggs, 1 at a time, mixing on low speed after each just until blended. Stir in dry pudding mix until well blended. Gently stir in 1 cup berries. Bake 1 hour or until almost set. (Center will still be jiggly.) Cool completely. Refrigerate 4 hours. Top dessert with COOL WHIP and remaining berries just before serving. Prepare as directed with reduced-fat vanilla wafers, PHILADELPHIA Neufchatel Cheese, BREAKSTONE'S Reduced Fat or KNUDSEN Light Sour Cream, JELL-O Lemon Flavor Sugar Free Fat Free Instant Pudding and COOL WHIP LITE Whipped Topping. Top dessert with white chocolate curls. Melt 1 oz. BAKER'S White Chocolate as directed on package. Spread into very thin layer on baking sheet. Refrigerate 10 min. or until chocolate is firm, but still pliable. To make curls, push a metal spatula firmly under chocolate to make curls. (If chocolate is too firm, let stand a few minutes at room temperature; refrigerate again if it becomes too soft.) Use toothpick to carefully place chocolate curls on waxed paper-covered tray. Refrigerate 15 min. or until firm. Use toothpick to arrange curls on dessert just before serving.